Jean, thanks for reading my review. Hope you’ll check out Makkai’s book! Thanks for the review. will be adding this to my Book Club list of suggestions. We are always looking for good books to read and discuss. Suzanne, thank you. 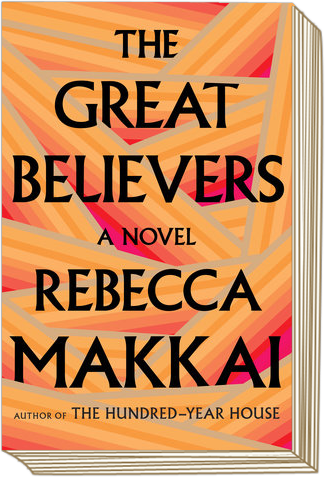 THE GREAT BELIEVERS would make an excellent book club read. I’ll provide you with more suggestions in coming months. Perhaps some future day, when my own MY LIFE WITH SHELLEY is in print, you’ll choose it for your club! thanks for the review – my brother died of AIDS in 1991 so i’m one of those sisters … I’ll read this soon. Deb, my condolences. A longtime friend of mine lost a brother in the very early days, just a few years before my friend and I became friends. It looks like another good book to put on my list. Thank you for the suggestion. What a walk down memory lane for me, Marianne. I was a nurse working in the suburbs of Chicago when the AIDS epidemic hit. After a few years, I quit my job and went to work in Chicago for a missionary group of nurses. It was one of the blessings of my life to care for the young people coming down with AIDS. I met so many lovely souls, and it was my privilege to care for them. We worked on some additions for the original AIDS quilt, sewing the names of some of our patients. Can’t wait to read this book.